It's back!!! Throw Back Thursday! It's a day to celebrate those quilts you've made before you started blogging and give them their 30 seconds of internet fame. Sandra at mmm!quilts contacted Jenn at Quarter Inch From The Edge and asked if she could baby sit this very fun linky party until things slowed down for her a bit. Jenn said yes and so here we are. The quilt I'd like to remember today, kind of has a tragic sad quilting story, if you are a quilt. I say it is overall a quite happy ending and one I'm very thankful for. 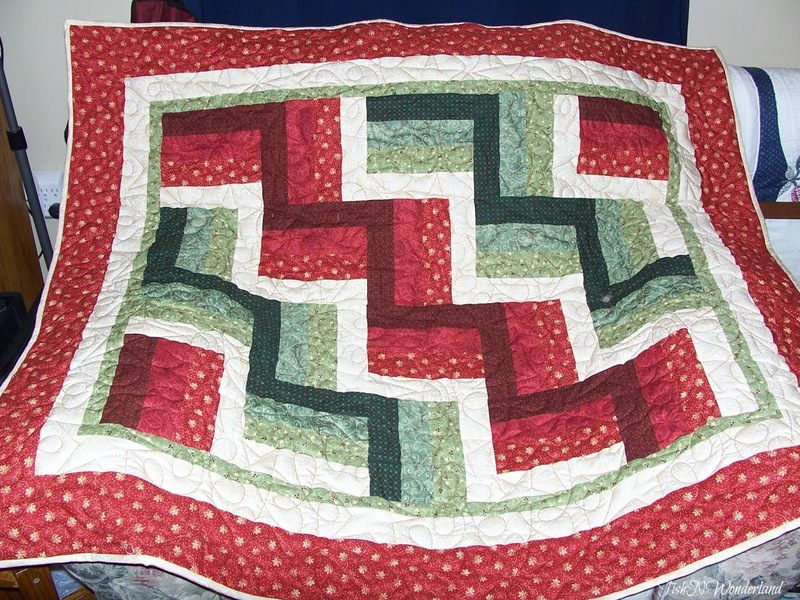 This rail fence quilt is the first quilt I actually bound and completed and the second quilt I ever pieced. After finishing my first quilt (a beastly Turning Twenty) I decided to try something smaller. I wanted to make a quilt for my good friend, more like a sister (people actually think we are sisters). She lived in a beautiful log cabin (we are talking authentic log cabin) and loved the color red, so I thought she needed a quilt. Not that she is lacking in quilts, her mom is one of my real life quilting friends, so she has tons of them. This was my first time strip piecing and I wasn't sure how successful I would be at it. I think I made around forty blocks in order to find the twenty you see in the picture that I could live with. Some of my seams where pretty wonky and left a bit to be desired. This was before I discovered a 1/4" foot. 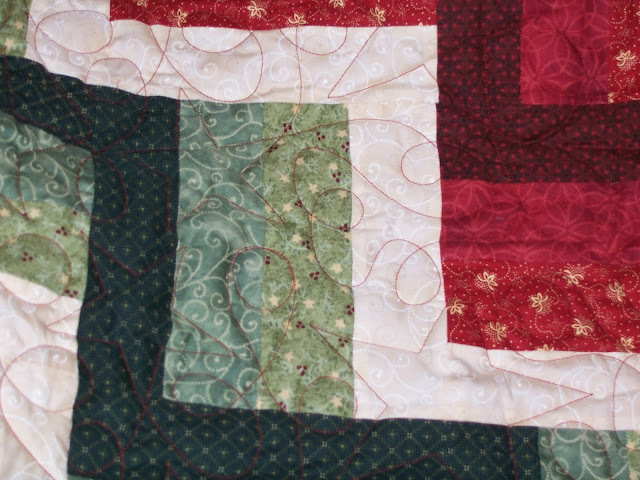 It was quilted by one of our local quilt shops using a red thread and loops and stars. I was so proud to give her this quilt and she loved it. It was displayed in her house. 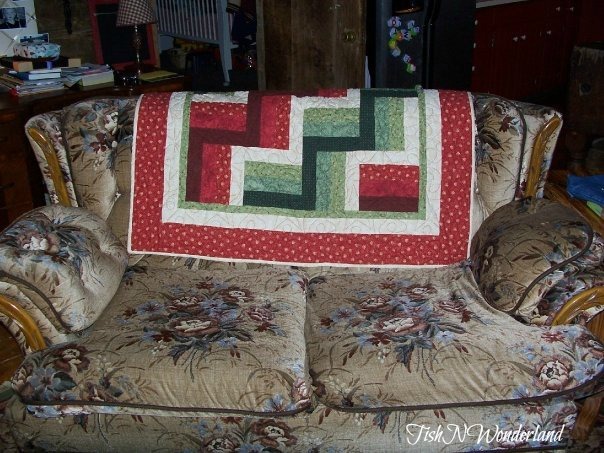 This is a picture of the quilt in 2009 (so I know I made it before then) I snapped of it on the back of a chair while visiting her. Her house was always a place of gathering, family and friendship. One of the most beautiful things in the house was the fire place. I always thought of it as kind of a fire pit. You actually had to kind of step down to it. It was a great place to sit and enjoy a glass of wine...especially when it was pouring the snow down outside. Sadly, a few years ago, something went terribly wrong after she and her husband had went to bed. Thankfully, their kids where not home at the time. While they where asleep, something in the chimney caught fire. They were both able to make it out of the home, but everything inside was a complete loss. I learned so much, things are just things. They are replaceable. I'm so thankful she and her husband made it out of the home completely okay. Now they live in a beautiful farm house. It still is a place of gathering, family and friendship. Just goes to show you, it's the people not the home. Home is where your family is. This post makes me realize, hmmm...maybe I owe her a quilt. Trust me, she still isn't lacking in quilts, but this time it could be one I quilt myself and I think that would mean even more to her. Now to dig through my pictures and quilt stash to see what quilt we can talk about next month. So excited this party is back. 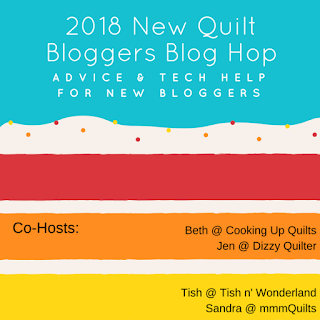 Speaking of next month, don't forget sign ups for the New Quilt Bloggers Blog hop will be open. I promise we are all busy behind the scenes getting this hop organized and ready. 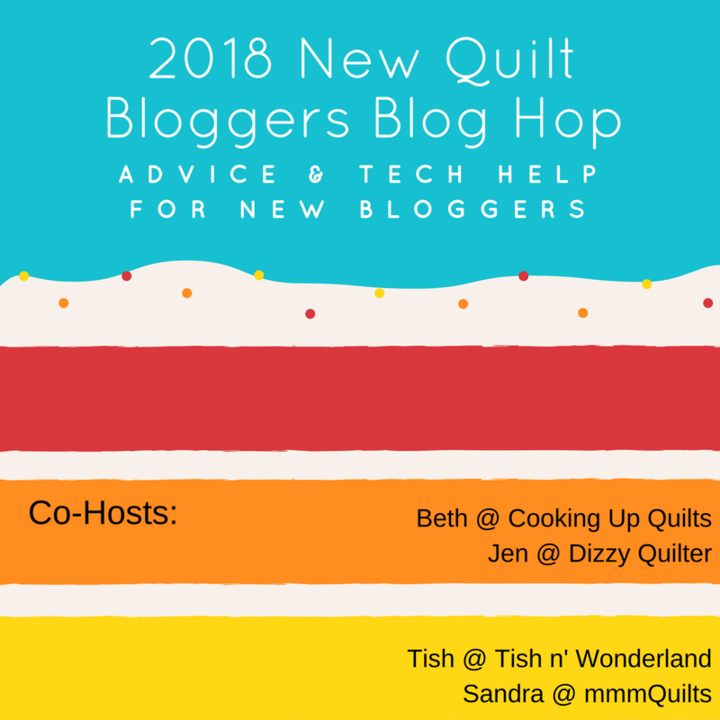 I can't wait to meet all the new quilt bloggers, talk some tech and community stuff and most importantly....quilting! So if you have been blogging for 3 years or less or know someone who has, stay tuned...hop with us. Even if you don't fall in that category...hop with us. Today I'm linking up with Throw Back Thursday. I was just thinking that same thing; that you need to make her a quilt to celebrate that the really important things in life are still here: your friend and her husband and your friendship. Fun post to read. That is a bit of a sad story for that little quilt, but I'm so glad you have pictures to share at least, and I'm so happy they made it out of the house safely. 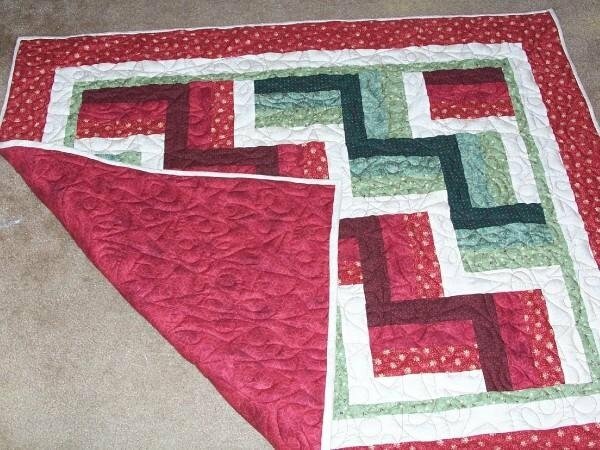 I'm sure she'd love to have a quilt from you now too, and I know it would be beautiful! I agree with Karen, this was a fun post to read! A tragic end to the quilt but the story that goes with it is heart warming. Yes I think you owe her a quilt.